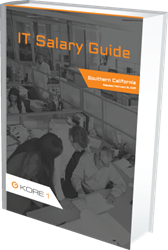 KORE1 is excited to announce the release of their annual eBook outlining the changes in hiring trends throughout the IT industry and evolution of salary ranges for IT positions within Southern California. KORE1 is a provider or IT services and solutions to the Southern California area. Our clients have delicate budgets to maintain, but with the knowledge of the current demand for top IT skills and the corresponding salary trends that our eBook provides, we hope that they can make informed decisions during the hiring process. KORE1, provider of IT services and solutions to the Southern California area, is excited to announce the release of their annual eBook outlining the changes in hiring trends throughout the IT industry and the evolution of salary ranges for IT positions within Southern California. The eBook offers a look at the growth occurring throughout the information technology sector and an in-depth analysis of salary ranges for IT positions, particularly in Southern California. Additionally, it provides businesses with insight into the latest hiring trends and perspectives. Over the last year, IT salaries have increased by 3.48% and are predicted to steadily increase throughout 2024. Both the local and national economies are expected to thrive under these conditions, making it all the more important for hiring managers to remain aware of competitive compensation for IT professionals. “Our clients have delicate budgets to maintain, but with the knowledge of the current demand for top IT skills and the corresponding salary trends that our eBook provides, we hope that they can make informed decisions during the hiring process that positively impact their businesses,” said Steve. To learn more about IT salaries in Southern California, click here to download the eBook. For more information on partnering with KORE1, please contact us at 949-706-6990 or info(at)kore1(dot)com. Our staffing solutions are highly flexible, with options spanning both on-site and off- site teams on a Contract, Contract-to-Hire, or Direct Hire basis. We also offer Payroll Services to help alleviate the burden of back office administration. When you need a highly competent recruiting partner to provide unparalleled staffing solutions, thought leadership, and consistent delivery results, KORE1 can help you achieve your business objectives.